I’m trying to muster the energy to tell you about last couple of weekends, with a couple of birthdays, parties and poorly children. In the meantime, though, I thought I’d jot down the directions for my favourite chicken soup because I’ve eaten loads of it this week. I love it when I’m feeling a bit off-colour, or when I want something light to eat that’s filling, or when I need comfort food, or when I’m fed-up with bland food. Bland this definitely is not! The minxes love it too, though I suspect in their cases it’s mostly because I let them add the flavourings at the end to their bowls as suits them, ie they get to play with their food. I also say ‘directions’ rather than recipe, because it’s not the kind of thing I make the same way twice. Finally, this amount is generally enough to feed all 5 of us. And we’re pretty greedy. 1. First, put 1.5 – 2 litres of chicken stock in a big pot. You could use 1 or 2 stock cubes and the right amount of boiling water if you wanted, but honestly, if you’re roasting a chicken any time soon, it’s much nicer and really, really easy to make your own. See directions at the end. 2. Add some vegetables (the last time I added some sliced bits off the green end of a leek and 2 big carrots sliced on the diagonal. The time before that it was chopped onion and a tin of drained sweetcorn. Whatever you like. Think about colours: leek, carrot, red pepper and sweetcorn would look amazing!). 3. Add some leftover chicken meat and / or 1-2 sliced garlic cloves and / or a chopped up ginger slice, if you like. 4. Bring to the boil then simmer for 3 mins to start cooking the vegetables. 5. Add some thin noodles (it’s ASDA udon noodles in the photo. They were perfectly light. Thread noodles are great, too). 6. Continue simmering until the noodles are cooked – 4 mins or so. 7. Remove from the heat then add your flavourings! 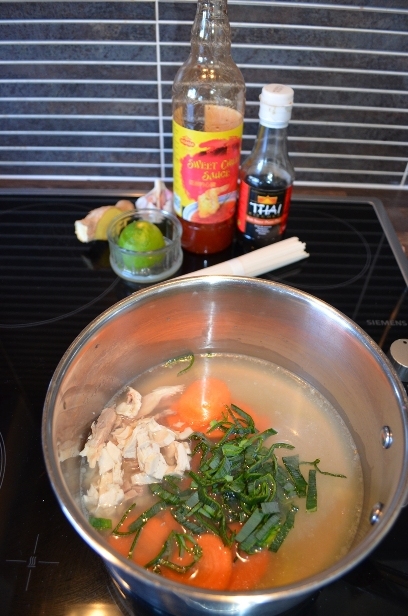 In this amount of soup, I like 2 tablespoons of sweet chilli sauce, 2 teaspoons of fish sauce (nam pla) and the juice of half a lime. I don’t add salt because it doesn’t taste right in this soup. 8. Serve with whatever bread you fancy. Adjust your flavourings to your own taste. Chicken Stock: pick the roasted chicken carcass of most of its meat. Put the carcass in your biggest pan. Cover it with cold water (about 2 litres of water). Add a single sliced garlic clove, a couple of spring onions chopped into 3 or 4 bits, and a couple of slices of ginger. Bring to the boil. Put the lid on. Simmer gently for 90 mins – 2 hours. Strain. Chuck away the bones and veg. The liquid will keep in the fridge for a couple of days, or you could freeze it the same day. 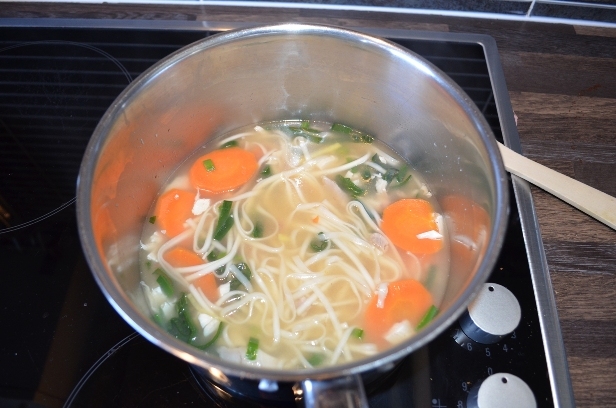 This entry was posted in food, recipe and tagged broth, chicken soup, Chicken Stock, healthy meals, tasty by GrumpyOldTrout. Bookmark the permalink.